Did you know that February is Pet Dental Health Month? It is very important to maintain proper oral hygiene for your pets. Brushing your pet’s teeth is a major component to maintaining good dental care. We encourage all owners to try to brush their pet’s teeth at least three times a week, but once a day is ideal. The purpose of brushing is to remove plaque before it develops into tartar. Plaque is a slime composed of bacteria, saliva, and food particles that adheres to the teeth and fills the pockets between the teeth and the gums. When plaque builds up it can quickly collect minerals from the saliva and form rock-like deposits, which is referred to as tartar. It is important for owners to know that dental tartar cannot be removed by any amount of brushing. By brushing your cat’s teeth daily the goal is to remove the plaque to prevent or slow the buildup of tartar, which can cause painful inflammation and infection at the gumline. Teach Them to LOVE Brushing! When brushing your pet’s teeth remember to be patient and try to make it a fun, positive experience. Start by handling the muzzle and lips of your pet. Then work your way into rubbing the teeth and gums with your finger. For cats, try placing a small amount of tuna juice on your finger when doing this as the tuna juice will encourage them to look forward to these sessions. For dogs, try the same with low-sodium chicken broth. Next incorporate using a finger-toothbrush and place a pea size amount of pet-friendly toothpaste on the brush. Brush gently back and forth or in a circular pattern from the gum to the tip of the tooth. Brushing the inner side of the teeth is not necessary. After brushing, reward your pet with a treat so they associate the process as a positive experience. Dry crunchy treats are preferred as opposed to soft food and treats as these products lack dietary abrasion which permits rapid accumulation of plaque. It is important to use toothpaste that is specially formulated for pets. Human toothpaste should be avoided, as it is harmful to pets due to the high amount of fluoride and other detergents. Here at VCMC, we provide a dental starter kit to our clients, which includes a finger-toothbrush and a sample of pet-friendly enzymatic toothpaste. In addition, we offer other dental hygiene products at VCMC, such as PerioSupport Powder and prescription dental diets, including Hill’s T/D and Royal Canin Dental DS. PerioSupport Powder is a unique daily oral powder designed to be used between veterinary dental cleanings to penetrate plaque, support gum health and freshen breath. Prescription dental diets are completely balanced diets and can be fed to your pet as their daily diet. The kibbles are designed to remove plaque and tartar as they chew. When Is It Time for a Cleaning? During your pet’s biannual wellness examination, your VCMC doctor will evaluate your pet’s mouth and overall dental hygiene. Based off of our clinical exam findings, we may recommend a professional dental cleaning. During this procedure, your pet will be placed under general anesthesia, while being continuously monitored by one of our veterinary technicians. 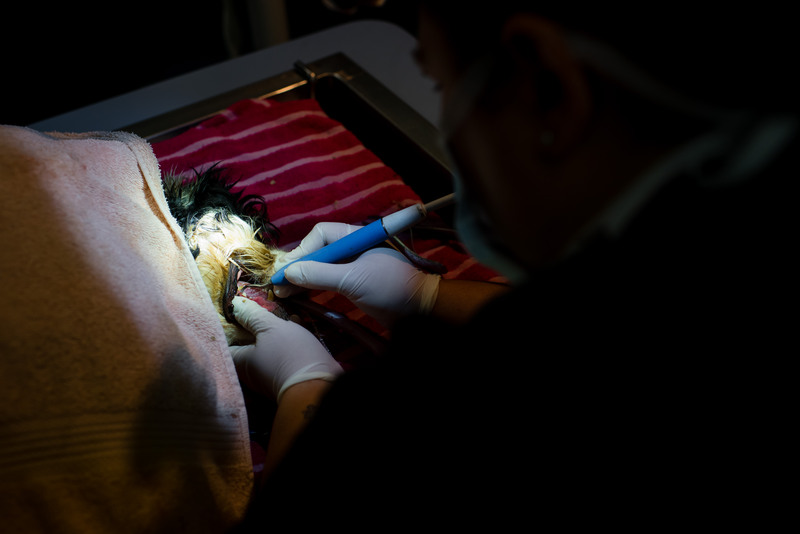 Your pet will have their teeth professionally cleaned and the doctor will evaluate each and every tooth. For evaluating the roots of the teeth, those parts that live under the gum line, dental x-rays will be taken. So how do we determine which teeth need to be extracted? The most common reasons for having to extract teeth are mobility/looseness, fractures of the tooth, tooth root abscesses/infections, resorptive lesions (akin to a big cavity), or recession of the gums. 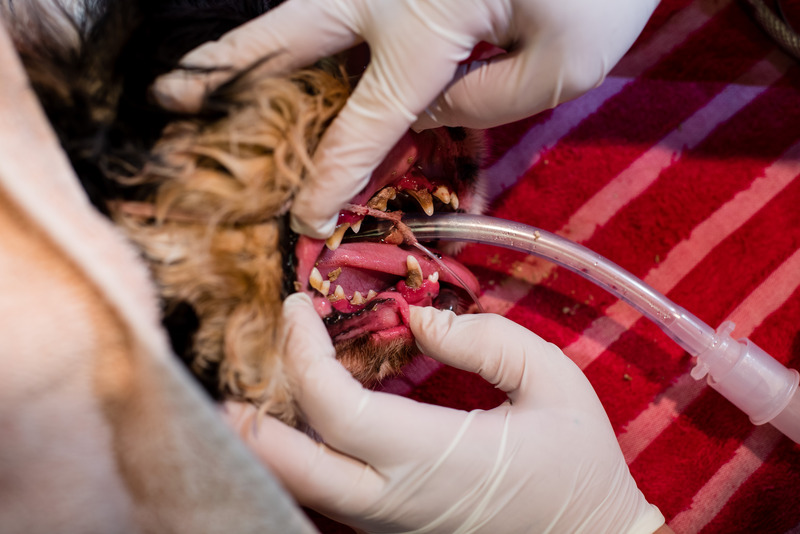 All of these conditions are very painful for pets, and extracting the teeth provides relief from the pain that they have been experiencing on a daily basis. Due to their stoic nature, many pets, especially cats, will not show any signs that they are having dental pain, yet owners note that their pets are much happier after their extractions. Signs of improvement after extracting troublesome teeth include better appetite, less vocalizing, and interacting more with the family. If there are any extractions, your pet will be sent home with antibiotics and pain medications to ensure that they will not feel any discomfort after the procedure. Why Does a Cleaning Require Anesthesia? We would love for our patients to sit still with their mouth open so we could examine their mouth and clean their teeth, but unfortunately, our patients do not understand the reason for the procedure and therefore will not sit still for it. Anesthesia also allows for us to clean the teeth better, including around and under the gum line, where bacteria tends to build up. While we understand that anesthesia can be scary, it is safer now than ever before. Your pet will be monitored continuously by one of our doctors, a veterinary technician, and a veterinary assistant. You can rest assured your pet is in the best hands at VCMC. We encourage all our clients to take advantage of a FREE dental exam* during the month of February to see if your furry friend could benefit from a professional dental cleaning. If a cleaning is warranted, simply schedule the procedure before February 28, 2019 to get 25% off! Give us a call at 973-887-0522 or click the link below to schedule your pet's free dental exam. We can’t wait to see your pet’s happy, healthy smile! *'Free Dental Exam' applies for patients that have had an examination with a VCMC veterinarian within the past year. New clients/patients or patients that have not been examined within the last year, would require a wellness examination.